This week's topping was chosen for a couple of reasons. Now one reason is for an honest recap. After reviewing Smucker's Caramel Sundae Syrup, I had an epiphany ...well, not so much an epiphany as a stomach ache. Nothing bad, I actually blew it off, but a few days later I was flipping through a magazine when I realized that the syrup I had eaten ...was a year old. I had bought it to make a turtle pie for LAST Thanksgiving. Ooops. It does explain why it tastied a bit off, though when i mixed it with the ice cream, it wasn't that obvious. Ok, the second reason is more exciting. When I went to Shaw's last night, I realized something. The tasty Twix Ice Cream in the freezer was lacking something: CARAMEL! Mmmmmm, I wondered how close to the real thing I could get. Only one way to find out! Having finished my bowl, I can honestly say that...I don't really know how much it helped. The caramel gets you closer to the Twix taste, but there simply aren't enough cookie pieces to trick your mind into thinking your eating a Twix. I do like it, and I appreciate the taste of a decent caramel, but it's no show stopper. Plus, it seems to have killed the urge to go back for a second scoop. 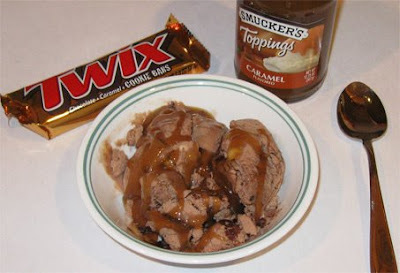 Next time I grab a bowl of Twix ice cream, I don't really know if it will have caramel on top.